Saturday, can you be more Goth? The three of us headed to Griffith Park for an afternoon hike in the general neighborhood of the Hollywood sign (which we saw, but didn’t actually get to — long story, that ended with the three of us running off-road, nearly bush-wacking, once we realized that she had an audition in 3 hours and we were still up on a mountain somewhere with an unclear path to return to the car!). Readying for a 7:00 p.m. Saturday night audition (very rare) at Disney Animation studios, Bex’s friend Sierra came over to help her get dressed for this role as a “believable goth.” We had some deliberation about how much costume she should put on — we encouraged her to stick with the eye-liner and the clothing, but avoid the heavy eye make-up. Back to the make-up counter. It’s definitely the strangest script she’s gotten — which is saying something — as it includes a goth 16 year old being lusted after by Abraham Lincoln. I don’t make this stuff up — it’s a Disney Feature Film! Anyway, we get to Walt Disney Studios and follow the guard’s directions past the medical center to the Animation building, directed by people on the ground around a ‘happening scene’ and into a far entrance to the building. We find the audition waiting room, and Bex signs in. There are girls with spiky mohawks and white faces. It’s so stereotypical, I had to get a photograph. So I called Bex over and went into the waiting room, an over-bearing mother taking pictures — so that I could take a picture of the entire scene. It was hysterical. While we waited for Bex we talked to another mom who had moved out there from Pennsylvania with her 16 year old daughter – and she told us her entire story. Then we wandered the halls checking out the art in the hallways (original animation drawings from Pinocchio, Beauty and the Beast, Sleeping Beauty and others). The artwork was absolutely fabulous and just casually hanging out in the hallway. I spent some time with Syd on the phone, working on her history research paper. 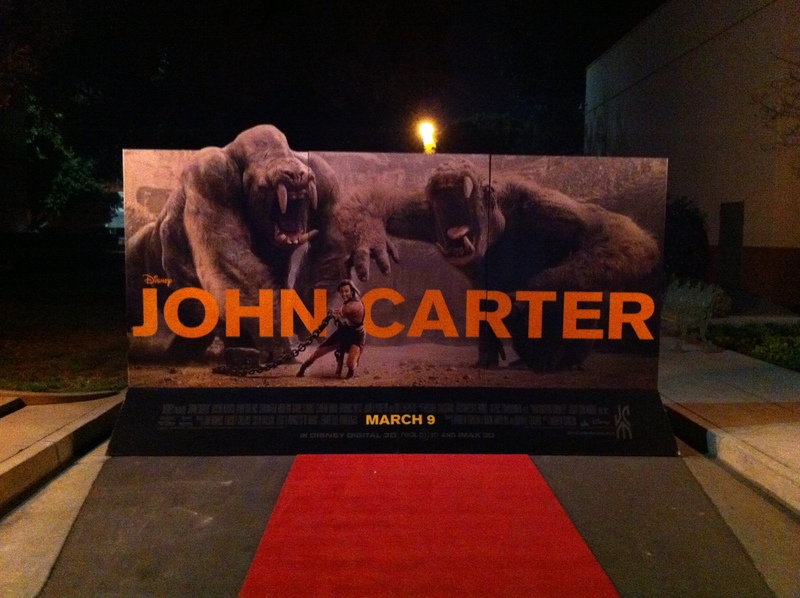 David went outside the building and made friends with the PR people setting up the event outside, a private screening of “John Carter” celebrating the 100th Anniversary of Edgar Rice Burroughs — Disney Studios, Main Theater. Of course, David smooth-talked our way into an invitation, so when Bex finished her audition, the PR manager (her name was Elaine, and the woman working the table was Janet) — let us check our phones — no technology allowed inside — and we went into Disney’s main theater for a 3D screening of a movie that doesn’t open until this weekend! The movie was exciting — unfortunately we missed the first 10 minutes or so — and it was a pleasure to enjoy it in such a reverent way. 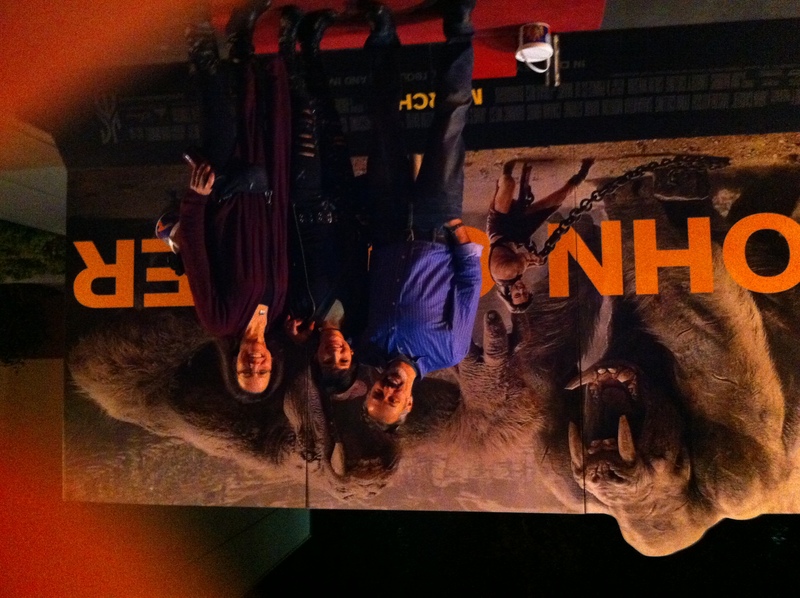 Incredibly respectful audience, carpeted floors, fabulous seats, and the LONGEST credits we’ve ever seen … ever. I’m not sure about this, but I think there may be a separate version of movie credits than what we usually see. It was cool — when the credits came, not a soul in the audience moved. It was silent, respectful, and everyone stayed seated until it was completely over. Final night in LA for David and me, for a while.